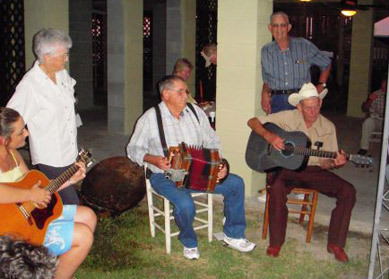 JUNE 23, 2010 (ERATH, LA) -- From June 17-20, the Acadian Museum of Erath hosted a TV film crew from ARD, the largest television network in Germany. The crew was filming Vermilion Parish Cajuns and focusing on the food, the culture and the effects of the BP disaster for a series on foodways in America. The crew stayed at the Caldwell House Bed and Breakfast in Abbeville. 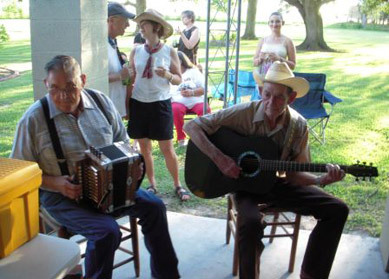 On June 18, the Acadian Museum hosted a Cajun Supper for the crew at the Perrin Farm in Henry, La. The crew started their documentary work in Montana at the Rocky Mountain Oyster festival, then went to Monument Valley on the Arizona/Colorado border to feature a Navajo chef using traditional Indian recipes learned from his grandmother. Later, they will travel to Chicago for a future food story at a Highend resto serving molecular food, then finally to Texas for a BBQ and Bourbon story. The host for the show is Ms. Hanni Huesch, the Washington DC bureau chief for ARD. 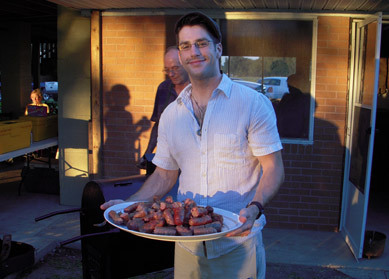 Bruce Perrin, Acadian Museum representative who helped to host the TV crew, displaying the grilled deer and chicken sausage prepared by Durphy Landry. Audrey Stimson organized the trip with film crew of two, Mathieu Mazza and Eva Probst. Bruce Perrin of the Acadian Museum assisted the group with their travels in Acadiana. 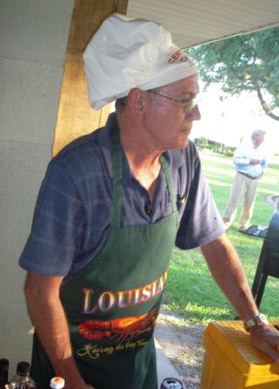 Durphy Landry prepares grilled chicken and deer sausage.